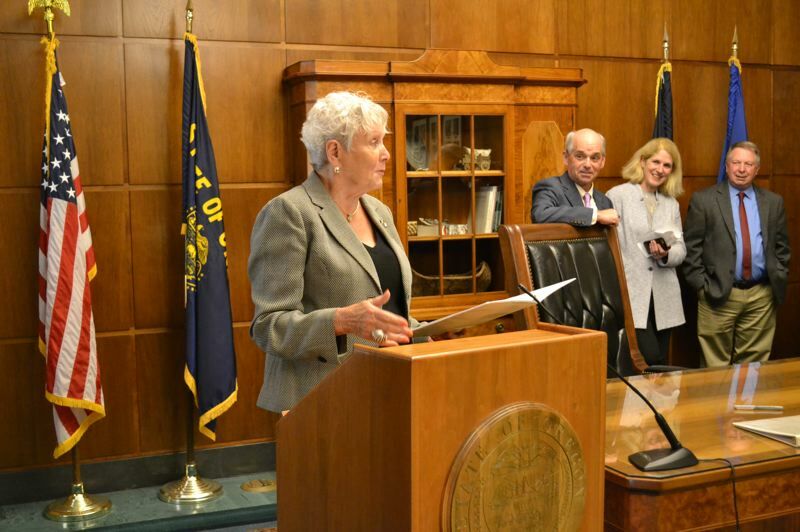 Former Portland Public Schools Chair Julia Brim-Edwards, who remains on the school board, is helping the transition of Bev Clarno, named by Gov. Kate Brown to be Richardson's interim replacement, following Richardson's death in February. Brim-Edwards is lobbyist for Nike who worked for Clarno years ago in the Legislature. She also is well acquainted with the office Richardson ran. Brim-Edwards' ascension to be one of Clarno's top advisers represents not just a bit of political turnabout, but, she acknowledges, a seeming conflict of interest. In an interview Friday, Brim-Edwards said she has taken steps to deal with the conflict by agreeing to stay out of the office's audits of schools. Clarno declined requests for interviews about Brim-Edwards' potential conflicts of interest. Edwards is the senior director of global government and public affairs at Nike. The audit function was at the core of Richardson's work as Secretary of State. He often mentioned Portland Public Schools and said he planned to be a robust auditor on the campaign trail while running for secretary of state in 2015 and 2016. In February, the secretary of state's office released its 2019-20 audit plan, which includes several audits that could potentially conflict with Brim-Edwards' interests in Portland Public Schools and Nike. One is a planned audit on the enrollment, funding and liabilities of the Oregon Public Employee Retirement System. Nike has joined public employees unions to form the Coalition for Common Good, which is working with lawmakers and Brown on business tax reform to fund Brown's requested $1 billion-per-year increase in education funding. Those in opposition of the increase in school funding say it would be sucked into paying PERS's unfunded liability rather than go to teachers. But there are several others, including a look at high school graduation rates and another one planned for special needs programs, that also could be shaped by the secretary of state's office to either scrutinize organizations Brim-Edwards works with or exclude them. It's not clear how Clarno will approach the audit function of the office. Though she referenced audits as one of the office's core functions while being sworn in, when asked by Salem Reporter what she wants Oregonians to know about her approach to the job, she mentioned she wants to bridge the rural-urban divide. It's also not clear who will be helping Clarno manage her new duties. One of Clarno's first moves, hours after being sworn in, was to ask Richardson's executive staff for their resignations. Deputy Secretary Leslie Cummings, whose hiring had been controversial due to her past involvement in a state technology debacle, was the first person to get called into the office Monday morning where Department of Administrative Services asked for her resignation. By 9:50 a.m. she had been let go. Fewer than 10 minutes later, Chief of Staff Deb Royal was called in. Steve Elzinga, Richardson's government and legal affairs director, was last, being called into the office shortly after 10 a.m. The three have declined to say how long Brim-Edwards and Hilderbrand will be volunteering in the office, or what specifically they are doing. Clarno said the Oregon Department of Justice has told her she isn't allowed to hire her son. Brim-Edwards provided an email showing that she disclosed her conflict concerning Richardson's schools audit to Clarno before the former lawmaker was sworn in. Shortly after noon on Sunday, March 31, Brim-Edwards wrote in an email to Clarno that while she was happy to assist her transition as a volunteer, "I ask that I be precluded from any decisions you make relating to the State Audits Division during this transition period." Brim-Edwards declined to discuss whether she shared with Clarno her opinion of Richardson's executive staffers before they were ousted. Richardson, a Republican, took office on a pledge to be nonpartisan. He hired Kip Memmott, an auditor for the city of Denver, to lead the division. Gary Blackmer, Portland's former elected auditor and a top auditor for Brown when she was secretary of state — and a supporter of Brim-Edwards' school board run — last year told the Portland Tribune that Memmott had a good reputation and seemed to be doing a good audits for Richardson. Speaking last September, Learn said the Portland schools audit was a high priority for Richardson. Learn told the Portland Tribune editorial board that Richardson didn't interfere with auditors' findings even when he had hoped for a different outcome, such as in a critical look at online schools that Learn had worked on previously. As Learn shared his draft audit with the school district in December 2018, Brim-Edwards — though an unpaid volunteer — took a leadership role in the district's efforts to tone down Richardson's upcoming audit, documents obtained from the secretary of state's office under public records law show. Brim-Edwards feared that auditors' look at the state of the district in late 2017 omitted the board's efforts launched to tackle problems over the course of 2018, records show. She said her efforts were an attempt to make sure the district was portrayed accurately and that auditors had a "full view" of things. They also were "worried (that the) report will demoralize the organization at a time when they're focused on building relationships and team building," said the auditors' summary of school officials' input. "Want a more neutral tone." Brim-Edwards was not present in that meeting. But on Dec. 10, Brim-Edwards sent Learn an email saying "I strongly object" to the draft audit's portrayal of the district as having not done enough to tackle misconduct reporting in the wake of the scandal over teacher Mitch Whitehurst, who was accused of decades of abuse. In the end, the language she questioned mostly went unchanged. "We understand that this audit of PPS was a specific political request by the secretary of state," said the district's Jan. 3 response to the audit. The response was signed by the board's brand-new chair, Rita Moore, vice-chair Julie Esparza Brown and Superintendent Guadalupe Guerrero, as well as Brim-Edwards. Days before the audit was publicly released, Brim-Edwards requested a meeting with Richardson himself to raise objections about the office's plan to brief lawmakers on the audit, she said. Instead, Richardson made his deputy, Cummings, available. Brim-Edwards said the meeting was constructive and allowed both sides to share their perspectives on the audit. Several secretary of state employees in the meeting or briefed on the meeting declined to comment on it. The next day, on Jan. 8, Brim-Edwards and Moore took part in an unusual pre-emptive press conference to give reporters their response to the findings of the audit, despite the audit having not yet been released. Brim-Edwards and Moore criticized the audit, saying it focused on issues from 2016 and 2017 which had already been addressed. It inaccurately portrayed past stains as the district's current blight, they argued. "It's disappointing that some Portland Public School leaders are trying to cover up highly concerning audit findings," said Richardson's tweet. "This aversion to accountability shows why transparency is needed." "This is an unsubstantiated claim that couldn't be further from the truth," Brim-Edwards shot back from her own Twitter account. "We embrace accountability, transparency and improvement." Following Richardson's death, Elzinga wrote an editorial for The Oregonian that also referenced Portland Public Schools' alleged attempt to silence the audit team. "(Richardson) called out systemic and heartbreaking discrimination in Portland Public Schools, even though powerful political figures wanted him to back down," Elzinga wrote. Does Brim-Edwards expect Clarno to have a different auditing approach to schools districts from that of Richardson? Reporter Aubrey Wieber of the Salem Reporter is a member of the Oregon Capital Bureau, a collaboration of EO Media Group, Pamplin Media Group and Salem Reporter.